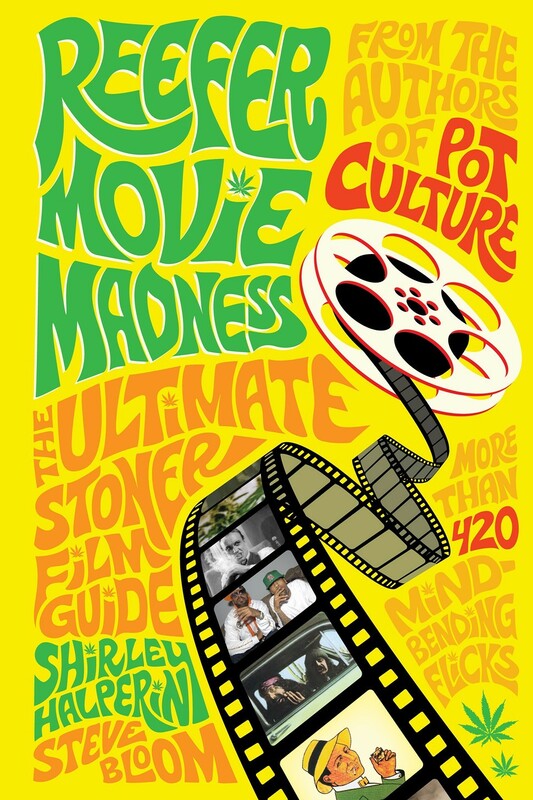 Fire up that streaming Netflix account and shut the blinds, definitive film guide Reefer Movie Madness: The Ultimate Stoner Film Guide hits shelves Friday, October 1. Covering 367 pages, with 52 special interviews, the paperback offers film buffs an essential collection of critical takes on 660 films from Anchorman to Yellow Submarine. The national release from Pot Culture authors Shirley Halperin and Steve Bloom conclude eighteen months of watching, categorizing, and critiquing two movies a day (around 800 in total), all the while while nabbing themed interviews with the likes of Snoop Dogg, Wayne Coyne, and The Doors' Ray Manzarek. A former senior editor at Entertainment Weekly, Halperin says the book is a must-have on college campuses this fall, as past guides to stony, counterculture film are either uncritical, incomplete, or dated. The genre has undergone a rapid mainstream reformation after a decades-long Hollywood stigma, Halperin says. She elaborates on her findings in the following Q&A, edited for length and clarity. Legalization Nation: When I first heard of this book, I thought it would be less serious, but you guys do actual critiques and ratings of all these films and there's all this great new material. Tell me about getting The Doors' Ray Manzarek to do a chapter on film. Shirley Halperin: That's a really funny story. He was in our last book too and afterwards [former editor of High Times and Celebstoner.com creator] Steve [Bloom] and I were doing a NORML conference in Berkeley and we wanted to bring in a celebrity, so we got Ray Manzarek to come. But to save money, because it's NORML and they don't have a lot of money and we were trying to raise money for the cause — I couldn't get him a car service. So I offered to drive him back and forth; it's kind of embarrassing. So he gets in my car after this panel. We, like, barely know each other, and the entire ride to Napa where he lives was him telling us these amazing stories about The Doors. I wish I had my tape recorder going, I'm sure it was in my bag, I should have just pressed 'record'. We were talking about how Jim died and just what he was like. I never got a sense of what a real rock star of his stature — he's such an iconic person — was like, until I spent an hour in the car with Ray Manzarek. So anyway, when this book came about I knew that he's a huge buff because when I dropped him off at his house and had to use the bathroom I walked inside and I saw massive, wall-size posters of like The Battleship Potemkin, I mean, I was like, 'Oh my god, this guy's obsessed with film.' All around his walls are these amazing film posters. So anyway I talked to him for the book, and, did you read that story about going to see 2001 with Jim Morrison? That is like the greatest story ever. I can't believe we have that in this book. I feel like it was something that I don't even know people know that Jim Morrison went to the premiere of 2001, they were baked, that they got there so late they had to sit in the front row, which turned out to be the best possible spot to watch 2001: A Space Odyssey. Legalization Nation: The Flaming Lips' Wayne Coyne has this great lament in the book about being falsely perceived as a victim of drug damage, then he's talking about The Wizard of Oz and his own sci-fi stoner film Christmas on Mars. Legalization Nation: Tell me about actually getting Snoop Dogg. Shirley Halperin: Pot Culture had celebrities without Snoop Dogg. I felt like it was such a glaring omission, so for the second book I was determined. I was like, 'We are getting Snoop Dogg.' And because I write about music and stuff I have these opportunities to interview musicians and as soon as I pulled out Pot Culture, he was like, 'I have this book. And I love it.' It could not have a bigger endorsement than having Snoop saying he has this book on his coffee table, basically. So it was a very short interview but I got exactly what I needed. I wanted to know what movie was his go-to when he was growing up, and he just wanted to sit around and watch something stony, and it was such a brilliant answer, this Richard Pryor movie that I probably never would've stumbled upon and it obviously meant a lot to him and that was a great answer. And then just like, 'What was your favorite role?' He's played so many stoners and has had so many amazing cameos, and 'What are your favorite munchies?' That was basically all the time that I had. He was very cool about it, he was very complimentary and I was really psyched. Now on the other hand I couldn't get Willie Nelson, which was a big omission the last time and he has had such an amazing acting career, but you know, it's not that easy to get an interview with Willie Nelson. Legalization Nation: You watched two stoner movies a day for a year straight, sounds like a dream job. Shirley Halperin: As much as you think it would be fun to watch two movies a day, when you have to do it every day it can be trying. I write about music and after a while going to a concert doesn't feel fun anymore. Legalization Nation: You started with around 800 movies to watch and included 660 in the book. You've stated your criteria for inclusion boiled down to films where pot was the star, played a role in a key scene, or films with broader drug themes. How did you come up with your list? Shirley Halperin: Steve kept a list since the 1990s of movies with pot in it, that was what we first started with, and I added a lot of movies that aren't stoner specific that I think are very stony and I think the stoners have embraced, so I added a bunch of those. I got to discover directors and movies that I didn't know had existed and look at it with a critical eye. That was something we were adamant about, because there have been books, stony movie guides before about counterculture films. We didn't want it to be a kooky book. We wanted it to be a serious film guide and have a critical eye to all these movies. 'How do you grade it? On how stony it is? It's message? How pot is portrayed? Or is it just fun to watch stoned, or different or more enlightening?' So that was the challenge of coming up with the criteria. ... I actually didn't know that much about movies. I feel like it was a learning process for me because I've written about music most of my adult life. Legalization Nation: What did you learn, if you had to teach a college course on the material? Shirley Halperin: There are certain themes. What's interesting I think is more the pattern of negative portrayals of pot which was what we see up until 2009. Most times the message you see in a pot movie is that pot is bad. They usually have to give it up, like in Half Baked Dave Chappelle's character has to give up pot for the girl. He has to make that decision. Knocked Up, same thing. Seth Rogen, he has to decide: either the bong or the girl and then in 2009 it sorta changed a little bit. All of a sudden — I give a lot of credit to Harold & Kumar, too — that perception, that stereotype, that thing movie studios insist on where it had some consequence, some negative consequence is changing. It's changing. And It's Complicated is a great example of that. There's more than one scene, there were huge pot scenes, and there were overwhelming positive effects to these older folks getting together and smoking weed together. That is something that's changing and public perception is shifting finally after all these years. We set the date of the birth of the stoner movie as 1978 when Up in Smoke and Animal House came out. Think about that. It's been thirty years of trying to get this point across and it's came across from the most unlikely people: Harold & Kumar, these Asian-American minority stoners and Meryl Streep and It's Complicated. How did that happen? Legalization Nation: Has the Cheech and Chong films been good for pot in the culture? It's almost like those roles helped keep the narrative for prohibition going these last thirty years. Shirley Halperin: In general they've been good. Sometimes the government will do a campaign and name it after some pot culture thing that came from Cheech and Chong's world. You're right, it's been bastardized a little bit. But for the most part, they were innovators. They were way ahead of their time. They broke molds racially, which was really important in the '70s, and they helped normalize marijuana and that is a huge, huge credit to them. And yeah, the next four movies were not that great, but there were plenty of stoners who really like Still Smoking really like Nice Dreams. They've gained cult status on their own, individually. Legalization Nation: Tell me about pot's roll in film ratings, which are notorious for their bias toward violence. Shirley Halperin: I'd read that It's Complicated received an R rating because of the pot scene where pot wasn't portrayed in a negative light. Now I would think we've moved to a time where I think we could get past that, that it doesn't have to have this message of being bad or having consequence but the studios seem a little behind. ... I really can't wait to see what the actors, the directors think of this book, because it deserves its own movie. Legalization Nation: Like a one-hour PBS special. Shirley Halperin: Yeah, why hasn't anyone done this before? There was another book in the '90s that does something similar, but to think that all of those huge movies have come out since then and there's been nothing like this. It's just shocking to me. Legalization Nation: Isn't there money to be made off positive portrayals of the sticky icky? The other thing that works against these movies is that I think the studios feel that stoners don't leave the house to buy movie tickets. There's definitely something to that. But if they made it easier to get high in the parking lot, I think the stoners would come out. With the risk of being arrested, not so much. Shirley Halperin: There's a lot of reading in it, a lot of new material. I think people are surprised by the heft of this thing. There are a lot of movies in here. By all means we do not claim to have every movie, this is just the conversation starter and hopefully it'll open the door for Volume 2. Danny Boyle' Sunshine, a tense, sci-fi thriller, and a huge buzzkill despite the stunning visuals. A much-needed Index. Hello? Reference book? Clueless is a remake of Jane Austen's 1816 novel Emma.